On Saturday, President Putin signed a decree that will immediately recognize documents issued by authorities in the troubled Donbass region in Ukraine. Representatives of the Normandy Four did not discuss Moscow's decision during a meeting on the sidelines of the security conference in Munich, Russia's Foreign Minister, Sergey Lavrov told reporters in Germany. "I don't think that anyone sees any change in [Moscow's] position" towards the Donbass region, the minister said. 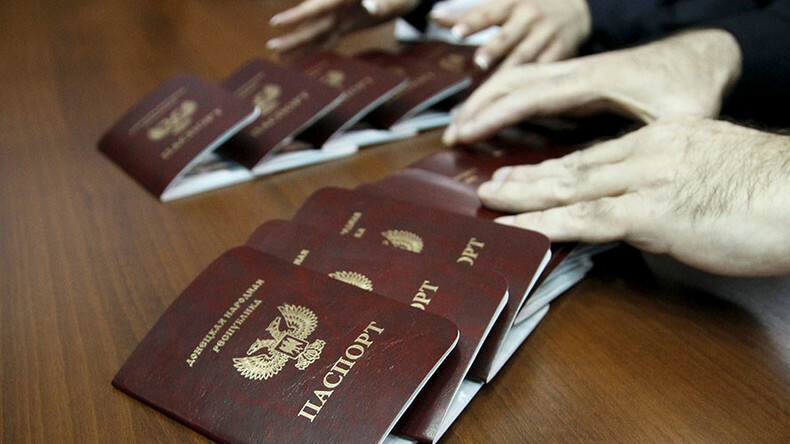 IDs and other documents, such as birth, death and marriage certificates, education diplomas and car license plates issued for Ukrainian citizens and persons without citizenship in the Donetsk and Lugansk regions, will be "temporarily" regarded as legal in Russia "based on the norms of international humanitarian law," Putin's decree stated. "It will allow people from Donbass, Donetsk and Lugansk to legally travel to Russia and use its railway and aviation services," Lavrov explained. Lavrov also confirmed that the order will be in place until the Minsk Agreements aimed at settling the conflict is implemented in Ukraine, as stipulated in the decree. Ukraine's President Petro Poroshenko slammed the decision, calling it "another proof of Russian occupation." After having spoken with the US Vice President Mike Pence on the fringes of the Munich conference, the Ukrainian leader accused Moscow of "violating international law" with its latest decree. Kiev "vigorously condemns" and does not recognize the Russian decree, Ukraine's Foreign Ministry said in a statement on Saturday. Having accused Russia of "violating Ukraine's territorial integrity," the ministry claimed the decision on the documents was a "de facto recognition of illegal authorities in Donbass." Kiev and the authorities of the self-proclaimed Lugansk and Donetsk people's republics signed a peace agreement in Minsk almost two years ago. The document is aimed at securing a full ceasefire in the region, while also providing for constitutional reforms that would give the region greater autonomy and special status. However, Kiev has so far failed to deal with the political changes, instead blaming Moscow for the unresolved conflict. Russia utterly fails to understand the tendency in the West to lay responsibility for the settlement of the Ukraine crisis exclusively on Moscow, Lavrov said earlier in Munich.